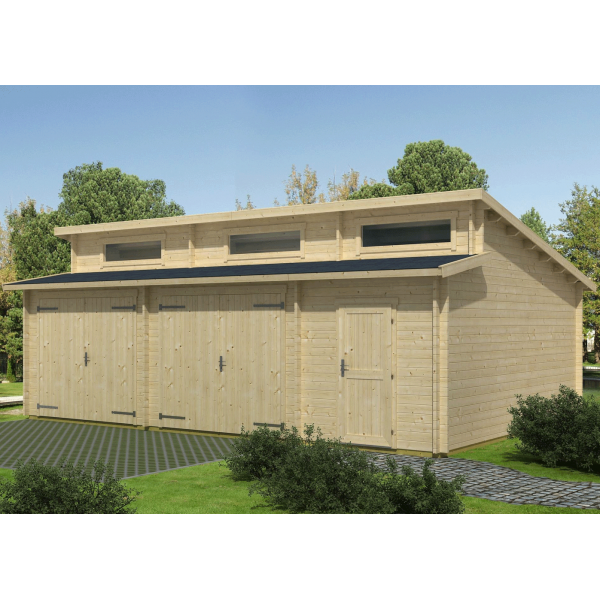 Norland Rawmarsh Log Cabin Garage: This impressive double garage is suitable for storing 2 cars in the main body of the building, there is also a completely separate room to the side of the building with a personal door which would make an excellent bike store or garden tool store. The garage is supplied without the main doors, there is the option to add a door of your choice from a side hung wooden door or an up and over style steel framed door. There are three windows in the top of the log cabin placed above the doors to let in plenty of light but also to allow for added security. The stepped roof on this log cabin garage gives it a contemporary appearance and allows for plenty of head room whilst not making the building too overbearing in your outdoor space. This log cabin is supplied with all the necessary parts to complete the build and full assembly guide to help you through the process if it is going to be a self-build. This impressive structure will provide you will all the storage you could possibly need, the space is not only useful but also attractive and will be in place for many years to come.